These two beautiful, wooded lakes are contained by glacial moraines. A glacier descending from Avalanche Canyon created Taggart Lake, while a glacier from Garnet Canyon created Bradley Lake. Even from the trailhead parking lot, the unimpeded views of the Tetons are stunning. Stay right at the first junction located a short distance from the trailhead. 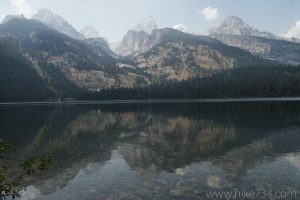 You briefly lose sight of the Tetons as the trail crosses over Taggart Creek. The trail then climbs up onto the moraine through the trees, alongside the playful creek. The impressive mountains quickly come back into view as the trail levels out. Continue right at the trail junction to head up the wooded ridge separating the two lakes. Views of Taggart Lake and the mountains are scattered, then become completely obscured as you drop down the densely wooded north side of the ridge. Take another right at the junction at the bottom of the descent. The trail skirts Bradley Lake, with filtered views and ample opportunities to access the lake’s shore. The picturesque scene from the shores features the quaint mountain lake nestled at the base of the majestic mountains. Follow the trail to the bridge at the lake’s outlet, then turn around back towards the ridge. On the way back, stay straight, continuing past the junction that brought you down to Bradley Lake. The trail climbs back up into the same forested ridge, only further west than before. At the top of the ridge, the southern-facing forest changes to a drier, more open forest with scattered views of Taggart Lake. At the bottom, the trail eventually works its way to the lake’s shore. Taggart Lake, nestled beneath a similar majestic backdrop as Bradley Lake, is equally breathtaking. The trail continues, skirting the east shore of the lake. The views of the lake are intermittent but get better as you approach the junction with the Taggart Lake Trail near the outlet. Continue south past the junction to the bridge over the outlet. After enjoying the view, turn back and make a right at the Taggart Lake Trail junction. Head through the trees and follow the trail back down to the trailhead. An alternative return option continues across the bridge past the outlet of Taggart Lake and up onto the moraine. It begins in open meadows and descends into the trees, then wraps around the ridge through a nice wetlands area back to the trailhead. 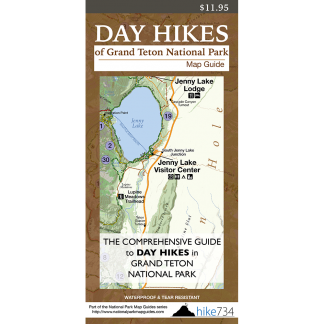 This alternative route adds approximately 120ft/40m elevation gain/loss and 0.7mi/1.1km to the trip.